I like the Subaru 360. It's very cool and as a retro ride it would be a great addition to any garage. Not the fastest, or the safest car, ever built it was the first car mass produced by Subaru and unleashed on the world. The 360 was built as a Kei car. A class of Japanese car that is still very much alive today with the current Subaru R2 taking it's design cues directly from the 360. Powered by a 356cc two stroke motor producing 16hp when introduced, and 36hp by the end, the 360 was never going to be a great performer. But, it could do 66 miles to the gallon while carrying four passengers. Quite amazing. Of course being a two-stroke you had to mix oil with the fuel. Subaru's answer was the fuel cap was a measuring cup. Very cool. The suicide doors really were 'suicide' doors with tests showing they could blow open at speed. That would have made life very interesting at 60mph. Beautiful motoring Japanese Kei style. 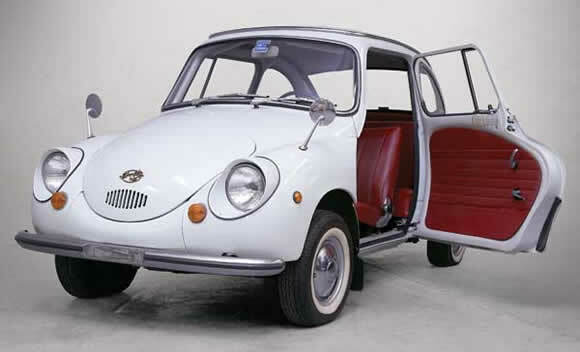 By the time the Subaru 360 was brought to the USA, the gas and oil were mixed automatically as you drove along, by the car's "Subarumatic" system. Thanks Steve. I did read about that. What a great name for the system too, "Subarumatic". 10,000 of the 360's were meant to have gone to the US but not a lot survive so it's great to see you keeping them on the road. Very cool car.